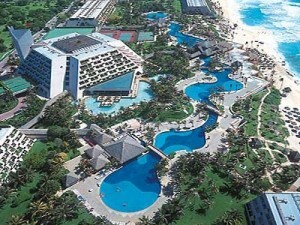 Cancun for Spring Break is a wonderland. Tiny bikinis, drinks flowing everywhere, the hot sun on your back, the nonstop partying atmosphere, and endless beaches in a foreign land. Come on, what’s not to get excited about? With the wide array of options to choose to go on Spring Break, you can’t ever go wrong with choosing Cancun as your destination. People from all over the world head to the Mexican paradise every Spring Break with the same intentions. It also seems to have the Las Vegas vibe of “What Happens Here, Stays Here”. Plenty of shops, beaches, and clubs to keep you busy all day and well into the next morning, and they have something for every taste bud. The biggest decision you will have to make is on where to make your home base on this partying voyage. With more hotels to choose from than you could ever need in the “Hotel Zone”. If you decide on Cancun for your Spring Break, be sure to check out these two party hotels. This hotel is a great option for Spring Breakers because of the all-inclusive features. 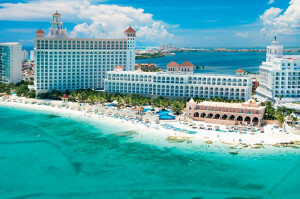 Sure, a lot of hotels in Cancun are all-inclusive, but the quality of the RIU is much better than a lot. Located right on the beachfront this hotel gives plenty of views of the ocean, and the buns on the beach that everyone is excited to ogle. Use the different bars to get your swill on, and power up for the night at one of the different restaurants, buffets, and A la Carte choices. Located just down the street from where all the biggest nightlife parties are held at the clubs, makes transportation an absolute breeze. This hotel gets packed, and with the 3 different swimming pools, water is filled with hot bodies and the music is blasting all day. The Oasis is undoubtedly THE place to be for Spring Break in Cancun. Being one of the largest hotels in Latin America, this is where everybody that isn’t even staying there heads for the day parties. This is where the MTV type Spring Break action happens. The 3 different pools are packed at all hours of the day, and being right on the beach has it’s benefits. The enormous stage right on the beach is host to many performers, Spring Break contests, and general shenanigans that every Spring Breaker needs to be involved in. Hit up one of the two swim up bars, 10 delicious restaurants including 2 buffets, and 11 bars scattered throughout the resort to get your memories started. Oh, did we mention this is all-inclusive? Because it is! This hotel complex has everything you could want in a Spring Break destination. If you are a fan of partying, hit up the foam party that is hosted here every week, and don’t bother getting out of your swimsuit, until about 3 AM and of course with someone lucky. The Oasis is hands down the top party hotel in Cancun, especially if you like hot bodies, beach parties, more drinks than you ever need, and packed swimming pools with DJs all over the place.